Just recently I was lucky enough to visit Sault Ste. Marie. What a place! It is home to a great mix of different things that I love, Wilderness, fresh air, spectacular fishing and pizza (40 Pizza Places!!) There is a population of around 75,000 people, but it doesn't feel like it at all. Thanks to it's quiet streets and kind people, The Sault (pronounced "Soo") is a city with a small town feel. Another tug on my heart strings is the Wildfires exhibit at the Canadian Bush Plane Museum kids of all ages will love this place. If you are looking for places to stay or eat I enjoyed my stay at The Travelodge City Centre whose recently updated rooms are perfect for relaxing after a long hard day of exploring or fishing. We dined at The Docks Riverfront Grill which has great food and it is situated along St. Mary's River. Another place that is definitely worth visiting is Aurora's West Side, which is famous for its pizza and home made pasta, and the cheesecake was great too! I thought it was a great idea that they sold their home made pasta if you wished to take it home to make your own pasta specialties. To top it all off, The Soo is home to and surrounded by some of the best fly and bait fishing found on this earth. As an avid bait fisherman I've always looked at fly fishing as "upper class fishing" meaning that it appeared to cost too much and take a long time to learn the art. I was happy to learn that fly fishing as a hobby is actually quite affordable. If you aren't sure that fly fishing is for you, I recommend to get a guide like we did they will take good care of you and hopefully you too will feel the rush and excitement of fighting a monster Steel Head as it takes off downstream. When we met our guides, Brad Hodkinson and Joe Nelson, from the Soo North Fly Shop they explained and demonstrated the techniques of casting. Then safely let us practice casting with the fly rod using the "1 oclock , 11 oclock" casting method. When we started to put on our waders we found out it was kind of tricky. Some of us (Amy) wore too many clothes and ended up having trouble getting the waders on. Brad and Joe had seen this trouble before and helped her out, or really helped her in. It was quite funny. Note: Wearing the waders does takes some getting used to as they are tight in all the wrong places. We were all suited up crossing the walking bridge over to Whitefish Island and following winding paths to get to the stunning St. Mary`s Rapids which is right on the US/Canada border and it hosts a beautiful view of the International Bridges. We slowly made our way into the crystal clear water, the colorful stones covering the bottom made it a bit tricky to maneuver. Out of the corner of my eye a couple of shimmering shadows darted away from us out in to the rapids and around the big rocks. It is a different feeling crossing a river, I felt alive and excited as I waded my way against the current to a tiny island. Joe helped us assemble our rods and in no time we were getting our lines wet. I still had no idea what to do or expect if I hooked into a Steel Head, so when Joe would come and check on me every so often, I would ask him a few "what if" questions on what to do. He basically said when the bobber goes under I should set my hook, sounded like fishing to me! I looked at the blue sky and, with a laugh, I recalled declaring to the group that 'I would kiss the first fish I caught' earlier during our walk, The smile faded when my bobber went under and It felt like a fish but it was not putting up much of a fight. After a few minutes I landed my first fish. Excitement shifted to disappointment when I got my first good look at it. Sure it was a fish, but there was no way I was ever going to kiss a sucker. Relieved that the first fish was out of the way, I refocused and patiently watched the pink bobber as it floated down stream. It surprised me when the pink bobber went under so quickly and the line went whizzing off the reel, I tried to stop it and I felt a very familiar pop as the line went limp. I hung my head in shame thinking that was 'my' fish. Joe came over and offered some tips like 'keep the rod tip up' and ' if the fish wants to run let it' "we'll chase it down river" he said. I was happy for the hints. My adrenaline kicked in, I knew this was my shot to patch up my pride. I kept the rod tip up as it took more line and in a split second the line had become wrapped around a rather large rock. `Oh No! What now! ?` I said. Fearing the worst knowing that it would haunt my dreams to leave empty handed now. That wasn't the case this time, and with Joe's words of wisdom, I was able to get the line off the rock and we headed for calmer waters to fight the energetic fish. The fight lasted almost another 10 minutes and I enjoyed every second of it. When that beautiful fish finally landed in the net I was filled up with pure joy. I celebrated with my normal evil laugh that only comes out when I have good luck and catch a good one. It felt like I was on top of the world and as promised I kissed the fish, and released her for another day. Soon after that we gathered up our gear and headed back to civilization, we snacked on licorice and reflected on the day, It had been a good one. St. Mary's Rapids will now be forever with me as the place where I was taught how to Fly Fish and where I caught my first Steel Head. 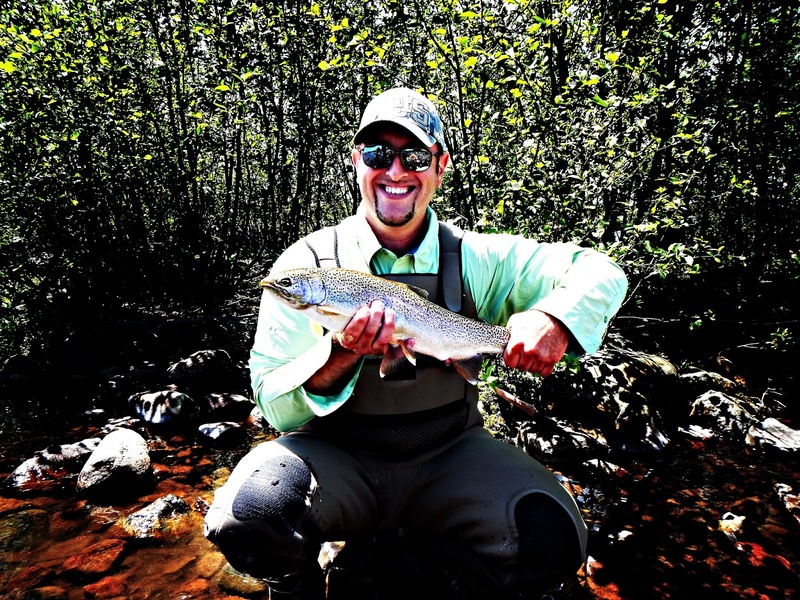 Ontario is a wonderful place to explore and Sault Sainte Marie is the place to be If you have ever wanted to go fly fishing.